Embryo Cryopreservation: Becoming A Parent Has Never Been Simpler! “I couldn’t believe that I was pregnant! I felt like I was the luckiest person in the world.” Rubina (name changed) one of our patients recollected her happiest moment in conversation with our reproductive specialist during her recent checkup. Rubina is in her early forties and she has conceived, thanks to an Assisted Reproductive Technology procedure called ‘Embryo Cryopreservation’ together with IVF, which helped her in getting pregnant even when nature had almost shut its door before her! By nature, fertility starts to drop in women above the age of 35. Since every woman is born with a finite number of eggs in her ovary, with her each periodic ovulation, the number of egg in her ovaries diminishes. After the age of thirty-five, due to a lot of physiological changes happening inside her body, a woman may or may not be able to conceive naturally. In other words, there is a good possibility that she might need the help of Assisted Reproductive Technology (ART) to have a baby. Herein, comes the importance of Embryo Cryopreservation, which together with ARTs like IVF, ICSI, IUI offer glimmers of hope to couples, who are a tad older (in terms of biology for conceiving naturally). Embryo Cryopreservation – What is it? 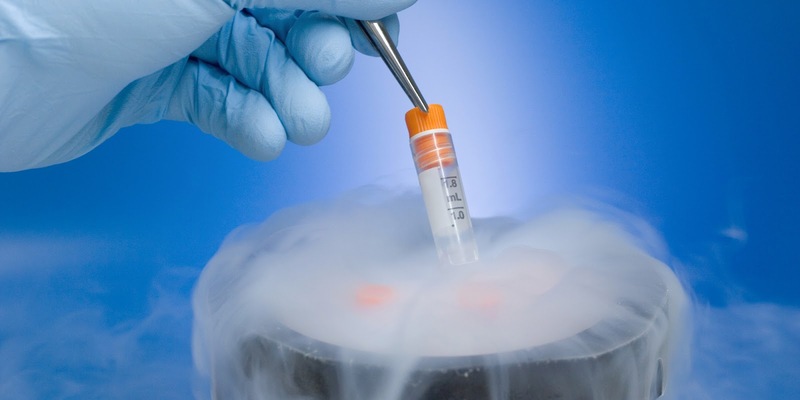 Commonly known as ‘Embryo Freezing’, it is a technique of preserving embryos in liquid nitrogen “through a series of cautiously coordinated steps”. The embryos are frozen in liquid nitrogen at a temperature of -196 degrees centigrade in specialized chambers or units. The embryos under this extreme sub-zero temperature attain a state of “suspended animation”. These ‘cryopreserved’ embryos can be stored for years without suffering any degradation in its physiology. It has been recorded that even after cryopreserving an embryo for over 10 years, the retrieved embryo has been successful in generating pregnancy through IVF. However, our common experience has shown that most patients use their frozen embryos within three to five years after they had been produced. Pregnancy in older couples is 50% more successful when IVF is conducted with embryos which were cryopreserved earlier. Embryo Cryopreservation - Are there any risks involved? The process of ‘embryo freezing’ is not without risks of failure. When embryos that are being cryopreserved are used subsequently some embryos do succumb to the supercooling and de-freezing. As per HFEA (Human Fertilization & Embryology Authority) located in the United Kingdom, there are negligible medical health risks occurring in children that are born from cryopreserved (frozen) embryos. However, proper counseling is suggested for patients undergoing this top-of-the-line ART procedure. Embryo Cryopreservation - The Best Solution to Working Couples Who Doesn’t Wish To Have a Baby Right after Marriage! Planning your family is the topmost priority these days, especially, when men and women are both contributors to the economics of a family. Career is a topmost priority in our modern times, which leaves the very limited choice for couples to take a major decision like starting a family of their own. But with Embryo Cryopreservation (Embryo Freezing) having become a standard among Assisted Reproductive Technology (ARTs) procedures, couples can defer their pregnancy and parenthood for a couple of years in the future and plan it out! Along with freezing embryos, this technique of sub-zero freezing using liquid nitrogen can also be applied in freezing sperms and ovum (eggs) both, contributed by younger couples which in the future can be used to successfully produce embryos through IVF and help that couple to become proud parents at their will. Is Embryo Cryopreservation Right For Me? You had an adverse reaction to a fertility drug and hence your treatment needs to be canceled just after egg collection. Under this scenario, storing your embryo for use in future is well justified. · You might be facing a medical condition where preserving your fertility right now happens to be the topmost priority. But foremost, you will have an option of using the cryopreserved embryo in IVF or ICSI cycles in the future and become a parent at a predefined date. That’s a wonderful thing, isn’t it? If you want to learn more about Embryo Freezing or you want to find out more about ART procedures and how we can help you in this regard, get an appointment with one of our reproductive medicine specialists. Till next time, keep following Genome Blog.